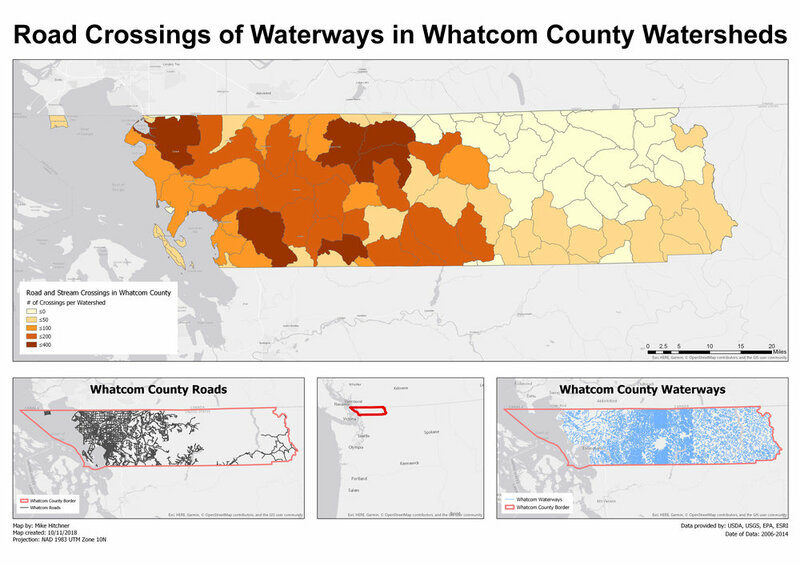 This map examines the number of road waterway crossings in the various Whatcom County Watersheds. EcoGeo consulting asked for an analysis of roadway river and stream crossings in Whatcom county. The map was to show a breakdown of the number of crossings in each distinct watershed within Whatcom county. EcoGeo consulting also needed a model that would allow quick and easy analysis of future counties in the future. The analysis involved the creation of a model that would be easily repeatable for future counties as the need arose. First, the model needed to find the watersheds that intersected Whatcom county. The data provided included roads, streams and rivers, Washington counties, and the watersheds of Washington State. The analysis started with selecting Whatcom county and clipping the road, stream and river data to the county. Then the road and stream data could be analyzed to determine intersect locations and merged together. Then it was important to find which watershed these intersections were located in using the identity and frequency tools. The map and analysis show that some watersheds have a much higher density of road crossings over streams and rivers. This analysis could inform restoration efforts as stated by EcoGeo consulting but could also prove useful for flood plan and evacuation analysis and disaster planning.